Elevated between 3976 ft and 10696 ft, the Ski Resort is among the 10 highest elevated Ski Resorts in Italy. The vertical drop from summit to base is 6719 ft. The average difference in altitude between base and summit of Ski Resorts in Italy is 3087 ft. Most runs are therefore relatively long. Alagna is among the 3 best rated Ski Resorts in the Aosta Valley. Season starts on Dec 5 and ends on Apr 12 (128 days). Average season duration in Italy is 130 days. The ski resort is among the 10 ski Resorts with best conditions in the Aosta Valley. Alagna features 88 sunny days on average per season. The average for all ski Resorts in Italy is 80 sunny days. March is the sunniest month with an average of 24 sunny days. 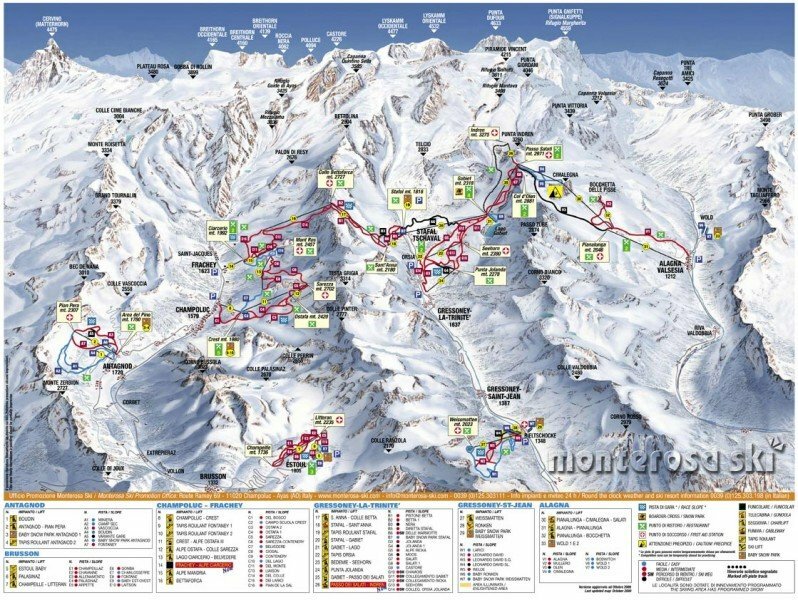 Offering 85 miles of slopes and terrain, Alagna is among the 3 largest Ski Resorts in Italy. Alagna is a small Italian resort situated at the foot of one of the highest mountains in Europe, the Monte Rosa. It offers some of the greatest winter and summer sports you will ever experience. Alagna brings traditional Italian alpine charm as well as incredible outdoor opportunities. Winter Skiing is second to none and off-piste tracks are among the longest and most exciting in the Alps. 2004 marked the opening of a state of the art lift system up to nearly 3000m. From here Alagna is connected to Gressoney and Champoluc. 27th December 2009 marked the re-opening access to the old freeride paradise thanks the new lift that links Passo Salati to Indren glacier. The new cable car is not served by piste, the top of the lift brings you to the beginning of an off piste ski trail which descends to Gabiet, marked out and controlled by the local alpine mountain guides and permitting full freedom of expression in the fabulous off-piste skiing available. Three valleys of perfect snow and opportunities for all levels of skiers and snowboarders. Off-piste powder skiing, heliskiing, or simply cruising on the open piste followed by delicious Italian wines and pasta, we guarantee you will want to keep coming back. Alagna is nestled under the towering Monte Rosa mountain. This majestic mountain range is a natural border dividing Italy and Switzerland. Alagna’s unique architecture of small wooden houses and hamlets with overhanging roofs and wooden balconies on each level, originated from their Swiss ancestors.